I don't know about this one, you guys. Coming two years after The Mummy's Tomb, this third sequel to the original The Mummy is just too much repetition and not enough originality. We have yet another high priest (this time it's John Carradine) traveling to Mapleton, USA where he wants to find the reincarnated Egyptian princess Ananka (this time it's a gal named Amina, played by Ramsay Ames, most famous for...this movie). Once he has pinpointed where Ananka/Amina is (spoilers: she's in Mapleton), he plans to have The Mummy nab her and bring her to him so he can execute an evil plan. Said evil plan is fortunately at least a little bit of a deviation from the same plot we've seen multiple times now, but it's too little too late. 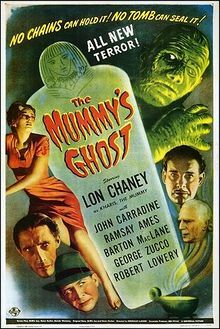 There's just very little to set The Mummy's Ghost apart from the other movies in the series. They didn't do themselves any favors by returning to Mapleton again, nor by having another high priest do evil stuff with his mummy. The movie begins with another recap of the legend and the curse, and it's told through dialogue instead of flashbacks that reuse old footage, but they still find ways to reuse footage from the previous movies. That footage is starting to wear out its welcome, guys. And we have another reincarnated princess plot? Is there nothing else The Mummy can do besides pine for the Egyptian princess? I mean, when I sit down to watch a Mummy flick, I want to see an undead nightmare tearing through a bunch of people who are trying to stop it. I want narrow escapes and some creative deaths. 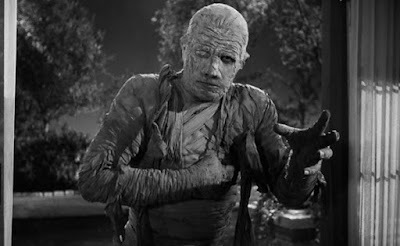 I want gas stations to explode while The Mummy walks toward us in slow motion. Maybe I want too much. It's not all bad. 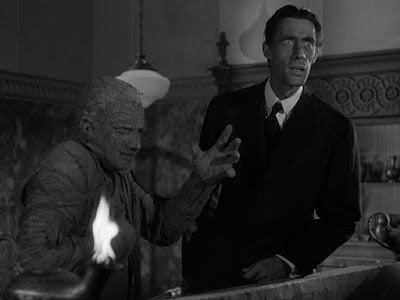 John Carradine (father of David Carradine, of Kung Fu and Kill Bill fame) is no slouch when it comes to the classics, having turned up in a whole bunch of great movies, including other Universal Monster flicks like House of Frankenstein and House of Dracula. He'll be best remembered for his legitimate mainstream work in movies like The Grapes of Wrath and the John Ford movies Stagecoach and The Man Who Shot Liberty Valance. What I'm saying is that John Carradine is kind of a big deal, and he is really good as High Priest #17. He does have some ulterior motives, though, so he's got that going for him...which is nice. Lon Chaney is back as The Mummy, or as the call him in Mexico, "La Momia." I have literally nothing to say about Lon Chaney's performance, other than that it's a thankless job. Still, I think maybe Tom Tyler did it better back in The Mummy's Hand. Sorry, Lon. I still love you. I have even less to say about the rest of the cast of this movie. No one really makes much of an impression, from the leading man who is Amina's boyfriend (played by a guy called Tom Hervey) to a professor (Frank Reicher from King Kong) putting the whole thing together based on hieroglyphics and a bunch of tana leaves. I guess Amina is a semi-interesting character, and I like how she develops skunk streaks in her hair after seeing The Mummy. She's like Rogue from the X-Men franchise. You heard it here: The Mummy's Ghost is like X-Men. Maybe I'm being too hard on the movie. There are things I like about it. I've already mentioned John Carradine, who is always watchable. This movie does do SOMETHING different by introducing an organ to the score, giving it that classic black and white horror feel. It would go on to become a cliche in the fifties, but it's the first time I think we've heard it in the Mummy series: it's night time and all is quiet in Mapleton. Suddenly, Amina looks up from her bed to see the looming shadow of The Mummy bending over her. She screams and the organ music swells. So iconic. I also like that they changed the high priests order from "High Priest of Karnak" to "High Priest of Arkam." I assume they pulled that name straight from the writings of H.P. Lovecraft. They also introduce a few twists toward the end of the movie. If you haven't seen it, I won't spoil things too badly (I think it's impossible to spoil these movies because there's almost no plot), but I do want to say that in this one, The Mummy actually succeeds at getting the girl he's going after. Like...he GETS her. There's no saving her this time. Game over, man. Well...at least until the next movie. And we know that there will be a next movie because this one ends abruptly with no resolution whatsoever. Ah, but see, it was all part of the plan, because this movie came out in July of 1944 and the story continued in December of that same year. It's totally like what they did with The Lord of the Rings trilogy, how they shot it all at the same time but released them over a period of years. You heard it here: The Mummy's Ghost is like The Lord of the Rings. Next time, we'll wrap up the original five-film cycle before moving into some wilder territory. See you then. High Priest of Cereal OUT!